The suicide rate is skyrocketing among American troops as numbers have reached nearly one per day in 2012, according to new Pentagon data revealed in a report on Thursday. Over the first 155 days of 2012 154 active-duty troops have committed suicide, far outdistancing the number of those killed in action in Afghanistan. The research shows a growing burden for troops in wartime demands in places like Afghanistan and Iraq. The military is also struggling with increase in the number of sexual assaults, alcohol abuse, domestic violence, and other misbehavior, the report stated. The number is up 18 percent from last year, and 16 percent from 2009, the highest year total of suicides in the military on record. 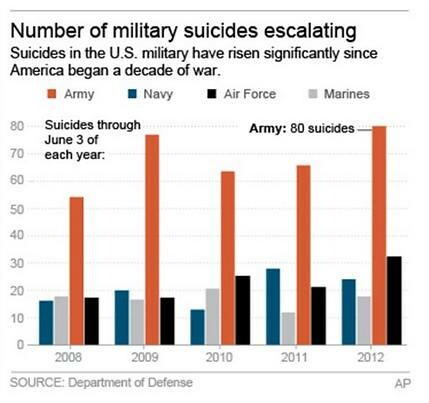 In both 2008 and 2009, suicide deaths outnumbered combat deaths. Kim Ruocco, widow of Marine Maj. John Ruocco, a helicopter pilot who hanged himself in 2005 between Iraq deployments, said he was unable to bring himself to go for help.